William was born about 1566. William's father was William Brewster and his mother was Mary Smythe. His paternal grandparents were William Brewster and Maud Mann; his maternal grandfather was William Smyth. He was an only child. He died on April 10th, 1644 in Plymouth, Massachusetts. 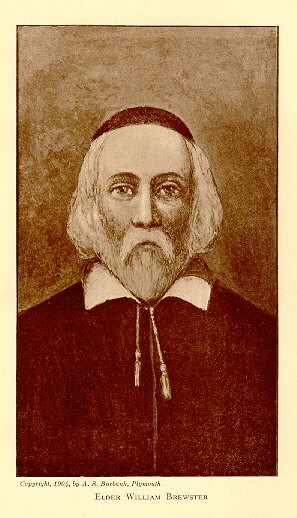 William Brewster was a Pilgrim colonist leader and preacher who came from Scrooby, in north Nottinghamshire and reached what became the Plymouth Colony in the Mayflower in 1620. He is generally considered to be the most famous of the pilgrims. He was accompanied by his wife, Mary Brewster, and his sons, Love Brewster and Wrestling Brewster. Son Jonathan joined the family in November 1621, arriving at Plymouth on the ship Fortune, and daughters Patience and Fear arrived in July 1623 aboard the "Anne." Scrooby Manor was in the possession of the Archbishops of York. Brewster's father, William senior, had been the estate bailiff for the archbishop for thirty-one years from around 1580. With this post went that of postmaster, which was a more important one than it might have been in a village not situated on the Great North Road, as Scrooby was then. William Junior studied briefly at Peterhouse, Cambridge before entering the service of William Davidson in 1584. In 1585, Davidson went to the Netherlands to negotiate an alliance with the States-General. In 1586, Davidson was appointed assistant to Queen Elizabeth's Secretary of State Francis Walsingham, but in 1587 Davidson lost the favour of Elizabeth, after the beheading of her cousin (once removed) Mary, Queen of Scots. Cambridge was a centre of thought concerning religious reformism, but Brewster's time in the Netherlands, in connection with Davidson's work, gave him opportunity to hear and see more of reformed religion. While, earlier in the sixteenth century, reformers had hoped to amend the Anglican church, by the end of it, many were looking toward splitting from it. On Davidson's disgrace, Brewster returned to Scrooby. There, from 1590 to 1607, he held the position of postmaster. As such he was responsible for the provision of stage horses for the mails, having previously, for a short time, assisted his father in that office. By the 1590s, Brewster's brother, James, was a rather rebellious Anglican priest, vicar of the parish of Sutton and Lound, in Nottinghamshire. From 1594, it fell to James to appoint curates to Scrooby church so that Brewster, James and leading members of the Scrooby congregation were brought before the ecclesiastical court for their dissent. They were set on a path of separation from the Anglican Church. From about 1602, Scrooby Manor, Brewster's home, became a meeting place for the dissenting Puritans. In 1606, they formed the Separatist Church of Scrooby. Initially, the Pilgrams settled in Amersterdam, and worshipped with the Ancient Church of Francis Johsonson and Henry Ainsworth. Offput by the bickering between the two, though (which ultimately resulted in a division of the Church), the Pilgrams left Amsterdam and moved to Leiden, after only a year. In 1620 he joined the first group of Pilgrims aboard the Mayflower on the voyage to North America. When the colonists landed at Plymouth, Brewster became the senior elder of the colony, serving as its religious leader and as an advisor to Governor William Bradford.